François-Paul Journe, constructor and master watchmaker in permanent quest for precision and innovative horological mechanic discloses a new time measurement - sportive and exclusive. F.P.Journe is launching the first mechanical chronograph of high horology on a wrist watch entirely in aluminium: case, bracelet and movement. F.P.Journe has chosen the Centigraphe as first timepiece to introduce its new collection, the “lineSport”. A collection of new watches of an astounding lightness, thought and conceived specifically for a proficient sportive activity, and that will include watches with manual as well as automatic winding. 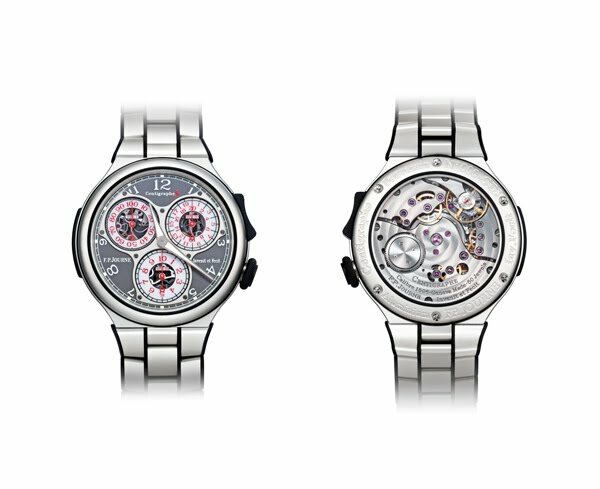 This collection has been inspired by an important collector, aficionado of F.P.Journe watches, who committed himself in numerous marathon and triathlon competitions and wished to have an ultra light sports watch, coupled with a movement of authentic high horology. With its measure of a 100th second, the Centigraphe Souverain seemed to be the perfect match to excel in his activities, where every second is counted. As in everything he undertakes, the collector goes beyond his ambitions and commits himself with an absolute determination to achieve his goal. In order to outshine in this new field, he changed his lifestyle drastically. From epicurean, he became a master of dietetics and managed to loose a tremendous amount of weight in a record time, while maintaining exceptional health. F.P.Journe wanted to pay tribute to the mental and physical achievement of this businessman who just like himself, started from scratch to become one of the biggest success stories, and today an extreme sportsman, sacrificing everything to his passion. F.P.Journe undertook long researches to find an ultra light and resistant material to receive his exceptional calibres ; while maintaining the standards of high horology that inhabit his everyday life. The Centigraphe Sport thus presents the very first F.P.Journe wristwatch entirely made of aluminium, movement, case and bracelet, in the search for absolute comfort and extreme lightness. The watch in its totality only weighs 55 grams. The passage from 18K rose gold - used for all the F.P.Journe movements - to aluminium was not without difficulty, for obvious technical reasons. F.P.Journe took his research to a higher level in an aesthetical quest to complete an appropriate contrast in colours. F.P.Journe perfected different methods of special processing in order to make the aluminium scratch resistant and give it anti corrosive and anti-allergic properties. Rubber inserts are fixed with an outstanding process to the end of each link of the aluminium bracelet, the sides of the case and the titanium crown in order to efficiently protect the watch from any chocks, just like the bumper of an ancient automobile. The hand-wound mechanical movement of the Centigraphe indicates elapsed times from a 100th of a second to 10 minutes, visible on 3 dials, each with a time scale in red. The 100th of a second hand revolves around the dial in one second on a scale marked in hundredths of a second. On the dial at 2 o’clock, the hand revolves once every 20 seconds on a time scale divided into seconds. The third dial, at 6 o’clock is graduated for 10 minutes. The chronograph is started, stopped and zeroed by a rocker at 2 o’clock in the case band, instead of the usual buttons on either side of the crown. This ergonomic design, perfectly fitted to the wristwatch, is patented. The hands of the 100th of a second counter, the 20 seconds, and the 10 minutes hand are driven by 2 different wheel trains, themselves driven by the centre of the mainspring (patented). Another separate train of wheels, also driven by the barrel arbor, drives the 10-minutes hand. The 100th of a second’s hand, released by the watch's escapement, makes one revolution of the dial per second. A wheel mounted on the escape wheel (4th wheel of the going train) releases the arbor to which the hand is fitted. The seconds are driven by the going train from the barrel, and by the energy of the chronograph train, as transmitted by the barrel arbor. One ingenious feature of the 100th of a second is that it may be stopped anywhere along its one-second journey around its dial, even between two 100th-second divisions, enabling a fractional reading. This is achieved by vertically disengaging the pinion of the 100th of a second hand from that of the escapement, which presses on the pivot shank and acts as a brake. The 20-seconds hand and the 10-minutes hand arbors are zeroed by hammer levers acting on snail cams. The 100th of a second hand is stopped at zero by a beak protruding from its pinion, which presses on a lever and thus blocks the chronograph train. The barrel features a maintaining power system in order to ensure that the driving force does not decrease during winding. The mainspring supplies at least 100 hours of power reserve without the chronograph, and 24 hours with the chronograph running.